2013 was a mixed bag year for handheld barcode scanner vendors, as evidenced by VDC Research’s recently concluded research on the global market (click here to learn more about the report). According to VDC’s published data, revenues contracted 1% from 2012 to $943 million. VDC anticipates continued softness in the market, which is expected to grow to $1.2 billion in 2018, at a relatively low CAGR of about 4%. This is primarily due to rapidly declining laser scanner shipments. Industry leaders – Datalogic, Honeywell, and Motorola Solutions – are particularly feeling the pinch with a small, but not-so-insignificant drop in overall market share. On the other hand, several new and emerging market participants, including Code and Fujian Newland, have seen significant revenue and share increases in the past 12 to 18 months – at the expense of these traditional incumbents – backed by particularly strong performances with their price-competitive core product lines. This research indicates that enterprise end users’ migration from legacy laser scanning infrastructure to the less proprietary camera-based imaging technology is helping level the competitive playing field. Coupled with these vendors’ targeted focus on regions, verticals, and application environments, this has them poised for future success. Another significant development is the ‘consumerization of IT’ trend brought about by the advent of consumer devices and scanning accessories, including sleds and sleeves (typically integrated with mobile platforms) being used in lieu of dedicated scanners. A growing number of enterprises today are actively considering integrating these solutions into their everyday operations. VDC’s data distinctly shows this marked shift in scanning technology adoption, especially since 2011. 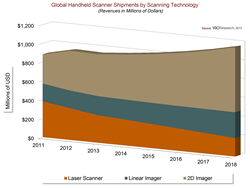 2D imagers have now officially surpassed laser scanners as the single-largest revenue contributor to the handheld scanning market. The value these camera-based imaging solutions offer, such as superior price-performance rations and unbridled support for a broad range of barcode symbologies and applications, seems to resonate tremendously with enterprises today. VDC firmly believes that, faced with declining technology investment funds, higher new customer acquisition costs, and growing global competition, data capture solution vendors must continue to identify and pursue such segments of attractive revenue growth. VDC Research is a leading technology market analyst firm covering the connected world. Founded in 1971, the firm provides market intelligence to the world's leading technology vendors, who rely on VDC analysts for winning market strategies and technology adoption decisions. With unmatched domain expertise and rigorous primary research methodologies, VDC enables clients to find new opportunities for growth and make critical decisions with confidence. Based on a unique blend of quantitative and qualitative analysis that offer granularity and breadth of coverage, VDC is organized around five practice areas, each with its own focused area of coverage. For more information, visit http://www.vdcresearch.com.